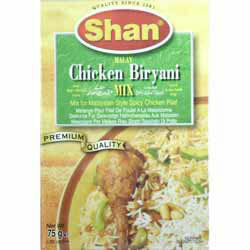 • Mix together the ginger, garlic and 2 tbsp Shan Malay Chicken Biryani Mix. Apply to the chicken and leave to marinate for 1 hour. • Add 1/2 cup water, cover and boil on a low heat until the chicken is tender. Then increase the heat to dry up all the liquid. 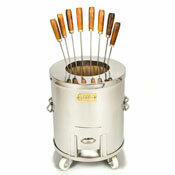 • Add the ghee/oil and fry the cooked chicken pieces on a high heat until evenly browned. Then remove the chicken and the Masala. • In the same ghee/oil, add the onions and fry until light golden brown. Add the green chillies, curry leaves, Shan Malay Chicken Biryani Mix, tamarind juice and 1 cup water. Cook for a few minutes, stirring continuously. • Add the fried chicken pieces, cucumbers and 1 cup water. Cook for a few minutes and remove from the heat. • Meanwhile separately cook the rice. Boil 10 glasses water with 2 tbsps salt and add the soaked rice. Boil until the rice is 3/4 tender then drain any remaining liquid. • Spread the rice and chicken curry in layers. Cover and cook on a low heat until the rice is tender. • Stir the rice and meat together and serve with raita and salad. Ingredients: Paprika, Salt, Red Chilli, Nigella, Star Aniseed, Cumin, Cinnamon, Black Pepper, Brown Cardamom, Clove, Turmeric, Garlic, Maltodextrin, Hydrolyzed Soy Protein, Citric Acid, Cane Sugar, Canola Oil, Natural And Artificial Food Flavour, Silicon Dioxide (anti-caking agent).